Ah yea, the end of another quarter means retransmission agreements are ending for a lot of cable companies/sat providers. KSLA/Channel 12/Shreveport is warning its viewers it may not be available come tomorrow on Dish Network. One has to love how it all works out in the end though. KATV includes this statement: "As a note to our viewers, KATV wants to emphasize that this is only a behind-the-scenes business matter happening at the corporate level. 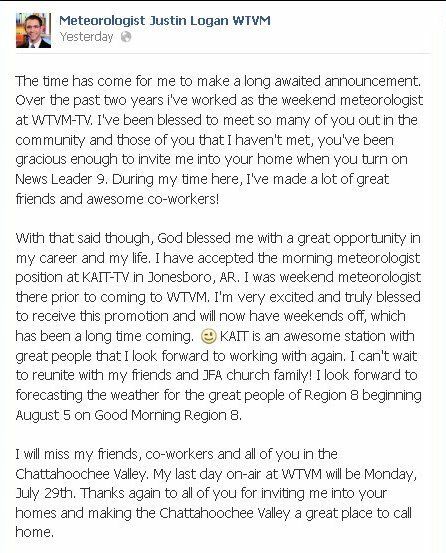 KATV will continue to bring you the best local news, weather and sports coverage you have counted on us to provide for more than 50 years." The article says the deal is expected to close by the end of the year. ** All stations are likely to go to one owner due to tax considerations. ***ABC/Disney not buying WJLA/Channel 7/DC. It's speculation ABC/Disney doesn't want the other smaller Allbritton properties. *** Is the sale between Tribune and Sinclair? Hearst? Hearst was touring WJLA last week. Could be who knows! According to information I've seen on the web there is no timetable for Allbritton to announce the winner bidder...if one even exists. I guess we are gonna have to wait and see! Could Nexstar be willing to sale KARK to get its hands on KATV? Well it could be the plan. Days ago NBC execs were in town visiting the station and rumor has it Nexstar could be selling the station so it can get it hands on the Little Rock market leader KATV. KATV along with all other Allbritton tv properties are up for sale and coming on Monday we will find out just who is bidding for the stations. 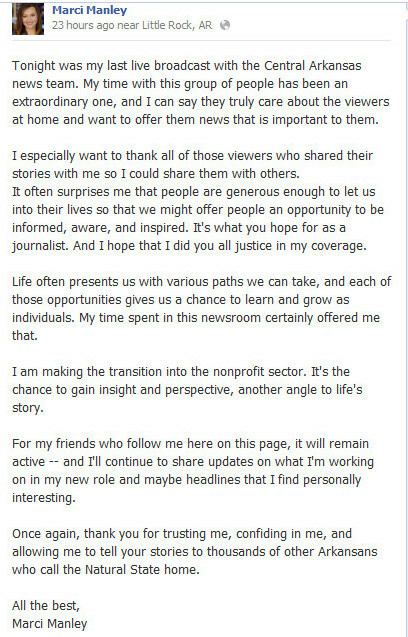 TV Newscheck reports there will likely be two bidders. WJLA/Channel 7/Washington DC will likely be sold separately as it is Allbritton's biggest broadcast property. TV Newscheck speculates, "Other possible bidders for Allbritton (possibly including WJLA), are Sinclair, Nexstar, Hearst, LIN, Meredith, Raycom, Scripps and Tribune. A key consideration is the duopoly potential in Allbritton's other markets: Birmingham, Ala. (DMA 42), Harrisburg, Pa. (DMA 43), Little Rock, Ark. (DMA 56), Tulsa, Okla. (DMA 59), Roanoke, Va. (DMA 68), and Charleston, S.C. (DMA 98). " We will have to wait and see, it should be interesting. Roger Susanin and Nathan Furniss (photojournalist) are leaving Channel 7 for Nashville, TN. Starting Friday, September 6, "Fearless Friday", a local high school football program in the Little Rock television market, is moving to KLRT "FOX16" from sister station KARK. The program will air Friday nights at 9:30 and 10:30 in the fall with FOX16 Sports Director Wess Moore. 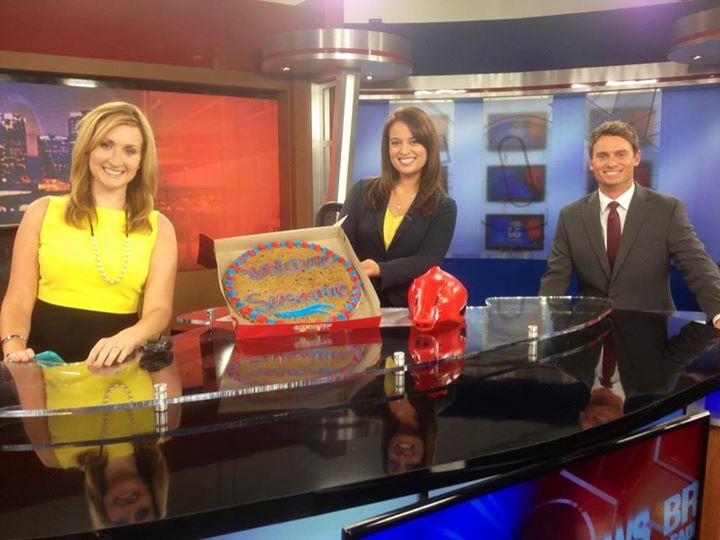 KAIT/Channel 8/Jonesboro is celebrating its 50th year in broadcasting. KAIT signed on on July 15, 1963. 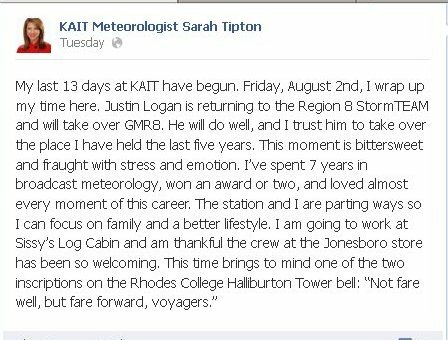 KAIT is an ABC affiliate serving vierwers in Northeast Arkansas and Southeast Missouri. KAIT.com has a special anniversary section filled with highlights from past years. 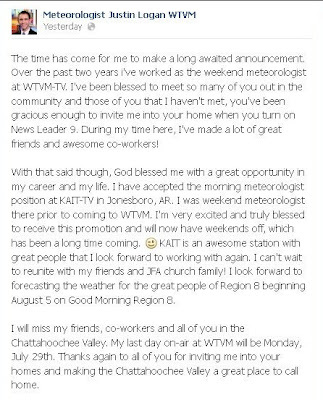 Wagner has been reporting for 40/29 News since August 2012 while Preusse joins 40/29 News from WTWO-TV in Terre Haute, Indiana where she anchored, reported and produced. 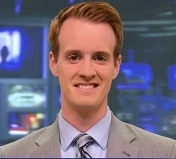 “In a short time Ben has proven to be a great story teller, and his move to the weekend evening anchor desk will enhance our ability to connect with the weekend viewer,” said KHBS/KHOG-TV News Director, Greg Shepperd. “An accomplished journalist and skilled live broadcaster, Paige is a great fit for the weekend evening newscast,” added Shepperd. Wagner and Preusse will co-anchor 40/29 News at 6:00 p.m., 9:00 p.m. (on sister station The Arkansas CW) and 10:00p.m. on Saturdays and 40/29 News at 5:30 p.m., 9:00 p.m. and 10:00 p.m. on Sundays. They will also report LIVE. LOCAL. LATE BREAKING. news on-air and on the station’s digital platforms throughout the week. KLRT/Channel 16/Little Rock welcomed a new weekend anchor to the desk this weekend. Susanne Brunner joins KLRT from CBS 13 in Sacramento, CA. 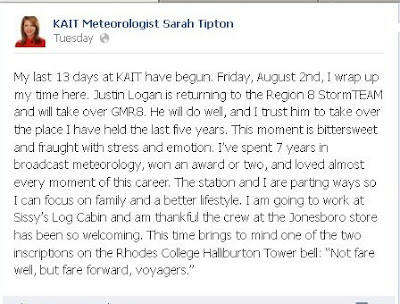 She can be seen each weekend anchoring alongside Meteorologist Natalie Walters and Jason Snavely. 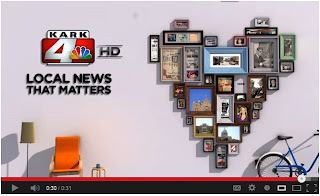 KARK/Channel 4/Little Rock has started airing a new promo featuring memories from the past. The promo is entitled "Home" and features pictures from the past, anchors and events and present on air personalities. 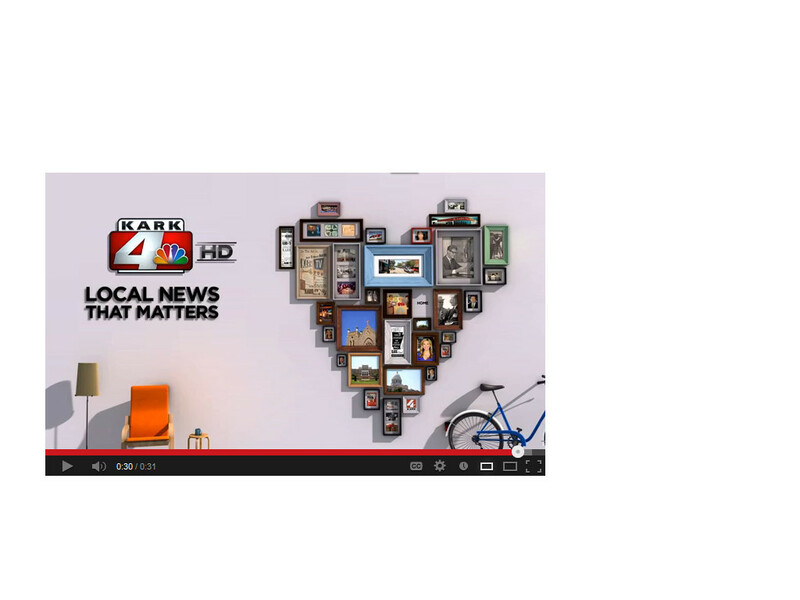 The promo is meant to promote "Local news that matters". Watch the promo HERE. 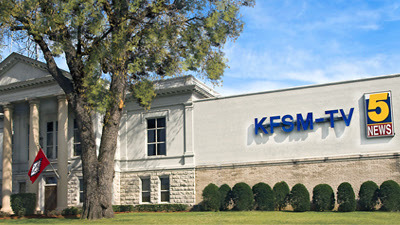 KFSM/Channel 5/Fort Smith has a new owner. It was announced today The Tribune Company has purchased KFSM and KXNW from Local TV Holdings LLC. The two companies announced the deal today. Once the deal is said and done Tribune will own 42 stations making it the largest commercial tv station owner. KFSM has more on the announcement on its website. The May sweeps numbers are in...and KATV/Little Rock/Channel 7 is the leader. KATV won all but one time slot this go around..with that being the 5am time period. 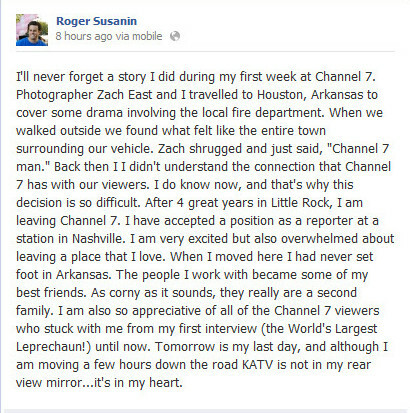 KATV news director Nick Gentry told AB.com, “We’re looking at that. If you look hard at it, you’ll see something a little bit strange about how our numbers all of a sudden just jump up at 6 a.m.” Arkansas Business.com has the complete run down of the numbers.